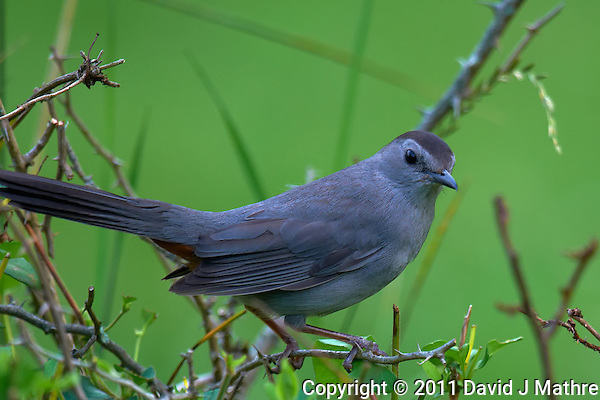 While sitting on my deck this evening, I captured images of some Grey Catbirds. Although the birds are pretty drab, they are good for practicing good long-lens technique. I used a Nikon D300 camera. The smaller DX sensor gives the illusion of 1.5x magnification for the 600 mm lens. I can get the same effect by using the D3x camera and cropping to the same size. Down side for the D300 camera is that the sensor is not as good in low light, and that the processing speed and buffer is not as fast as the D3 series camera bodies. I also saw a Ruby Hummingbird, however it was too close to focus with the lens I was using. There is nothing much in bloom right now, so I might get a hummingbird feeder to see if I can get some local hummingbird images. 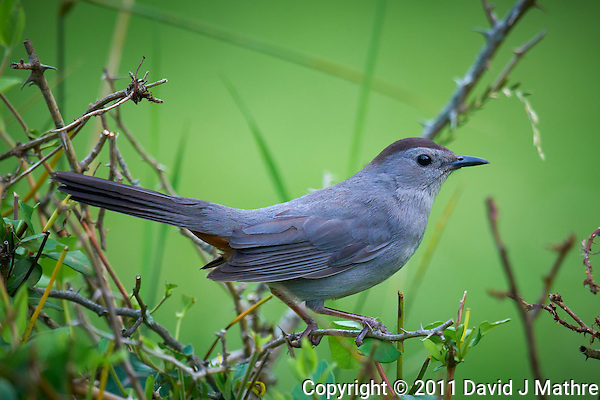 Grey Catbird. Early Summer Nature in New Jersey. Image taken with a Nikon D300 and 600 mm f/4 lens (ISO 250, 600 mm, f/4, 1/200 sec). Raw image processed with Capture One Pro 6, Focus Magic, Nik Define 2, and Photoshop CS5. 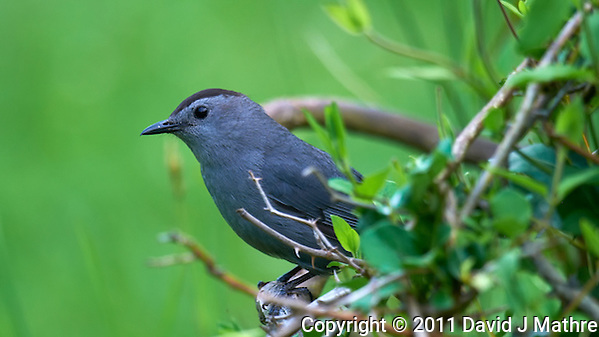 Grey Catbird. Early Summer Nature in New Jersey. Image taken with a Nikon D300 and 600 mm f/4 lens (ISO 200, 600 mm, f/4, 1/200 sec). Raw image processed with Capture One Pro 6, Focus Magic, Nik Define 2, and Photoshop CS5.